Ukraine President Viktor Yushchenko wants to pull up of parliament with his allies and prompt early elections to end a political standoff with Prime Minister Viktor Yanukovych. Yushchenko and Yanukovych had agreed in principle to hold early polls on Sept. 30, but both factions in parliament have been obstructing a string of bills necessary to call elections. 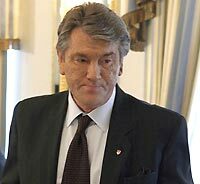 Yushchenko gave the legislature until midnight Thursday to pass the laws. "If a solution is not reached, my party and (Yulia) Tymoshenko's party will meet and formalize our withdrawal from parliament," Yushchenko said. "Then elections will take place automatically in 60 days," he added. Ukraine has been embroiled in a political crisis stemming for constant disputes between the two leaders since Yanukovych's coalition won elections in 2006. Last week, President Yushchenko fired the country's prosecutor-general and the Interior Ministry sent police to surround the prosecutor's office to prevent his eviction. The pro-Western Yushchenko then seized control of the ministry's forces and deployed units to the capital, Kiev - but Interior Minister Vasyl Tsushko refused to recognize the order. The moves raised fears that weeks of arguments between Yushchenko and Yanukovych could spill trigger violence. Tensions partially eased Sunday after the president and premier agreed to hold early elections. "Ukraine is carrying out a plan to get out of the political crisis. It is up to parliament to implement the plan," Yushchenko said. "Elections on Sept. 30 will be key to exiting the crisis and it will help Ukraine emerge stronger," he added. Lawmakers were to vote Wednesday on the last in a series of bills necessary to call the early elections but the proceedings were interrupted by a bomb threat and mutual recriminations and disorder, with each side accusing the other of trying to sabotage the agreement.